On the brink of a new century, Jake is living it up in New York City. An immigrant from Russia, Jake (Steven Keats) has spent several years happily assimilating into his new country in the late 1890s. He lives in a Jewish community, separate from Gentiles, but otherwise acts like a young American: boozing, dancing, and making love to a beautiful dancer named Mamie (Dorrie Kavanaugh). One night, however, Jake receives news that his father has died. In one fell swoop, he loses his (presumably beloved) father, and also gains back his (maybe not so beloved) wife and young son. Reluctantly shouldering the obligations of a family that he didn't think much about during the previous few years, he sends for Gitl (Carol Kane) and their son, who comes to be called Joey (Paul Freedman). From that point onward, Hester Street belongs to Gitl. Meek and mild, Gitl is not warmly welcomed to America by her husband, formerly known as Yekl. He is brusque and distracted and obviously bothered by her mere presence. And their son! Jake has no idea how to be a father, nor does he really want to be one. He has tasted the fruit of cultural freedom and has no desire to return to eating the vegetables of his old life. Jake keeps running back to Mamie, for whom he developed strong feelings. (He never bothered to inform her that he was already married with a son of his own.) For her part, Mamie remains enraptured by Jake, wondering how he could ever have loved the very traditional and very quiet Gitl. Initially, Gitl has no idea that Jake is spending his evenings illicitly with Mamie. Either too shy -- or, more likely, thoroughly cowed by Jake -- to take any independent actions whatsoever, she mopes around the tiny apartment that they share with Bernstein (Mel Howard), a fellow worker at a factory where they are employed. The gentle and scholarly Bernstein spends his evenings in deep study of the Torah, reluctantly lying to cover up what Jake is doing. Even when he does come home, Jake is often abusive toward Gitl in his speech and in his actions. He doesn't hesitate to hit her whenever he feels like it. He never extends a hand to help her adapt to America, although he continually insists that she adapt quickly. How is Gitl supposed to change? Jake never tells her what to do, instead pushing her to stop doing things he doesn't like or that make him feel uncomfortable. First published in 1896, the novel Yekl: A Tale of the New York Ghetto was written by Abraham Cahan, himself a Russian Jew who emigrated to New York in 1882. Cahan learned English, began teaching the language to newer immigrants, joined the Socialist Labor Party of America, and became a newspaper reporter. A short time later, he became an editor and then helped to found the Jewish Daily Forward, serving as editor and publisher of the influential newspaper for more than 40 years. For the same company, Silver directed a 30-minute short titled The Long Long Journey (1972), which followed a family of Polish immigrants having a difficult time adjusting to life in America, and then she helmed two more short films. She also wrote an original script for Limbo (1972), a drama revolving around a group of women whose husbands were M.I.A. in Vietnam. Clashing with director Mark Robson, she reportedly refused to make changes to the script to "soften" a character, and so was rewritten by James Bridges. Deciding to make her own film, Silver enlisted the assistance of her husband, who raised the financing needed and served as producer. Silver told American Film Magazine that she decided she would "make one that will count for my family. My parents were Russian Jewish, and my father was no longer living, but I cared a lot about the ties I had to that world. So that was how Hester Street started." Hollywood was not interested, so Silver and her husband formed their own distribution company and gained an audience that spread far beyond what she might have expected. 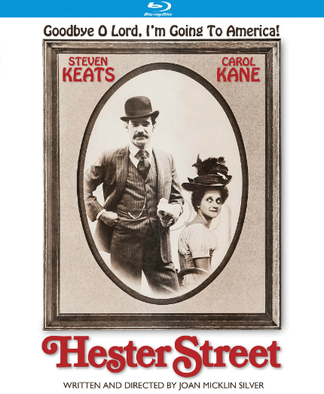 Hester Street is a film that feels instantly authentic to the period of its setting, while also contemporary in its perspective on the story and characters. What really grabs, though, is Silver's sense of narrative style, which keeps pushing the story forward, even as it allows time to get a clear understanding of the personalities and motivations of the small cast of primary players. It's elegant and easy to watch, without calling attention to its straightforward nature. All these years later, it feels fresh on first viewing, and I imagine that its comfortable bearing will continue to wear well. Just 22 or 23, Kane earned an Academy Award nomination for her performance (Louise Fletcher won for One Fly Over the the Cuckoo's Nest). She had earlier appeared in Carnal Knowledge and The Last Detail (discussed in detail here) and thereafter appeared in Dog Day Afternoon, Harry and Walter Go to New York (covered here), Annie Hall, The World's Greatest Lover and the bizarre and deranged The Mafu Cage. After a remarkable decade, Kane probably became best known for her sweet supporting bits on TV's Taxi (opposite Andy Kaufman), yet she has remained busy to this day in films and television. Joan Micklin Silver went on to make two more significant films of the 1970s, Between the Lines (1977) and Chilly Scenes of Winter (1979). Her daughter, Marisa Silver, wrote and made her directorial debut on Old Enough (1984), a sterling drama centering on two teenage girls. 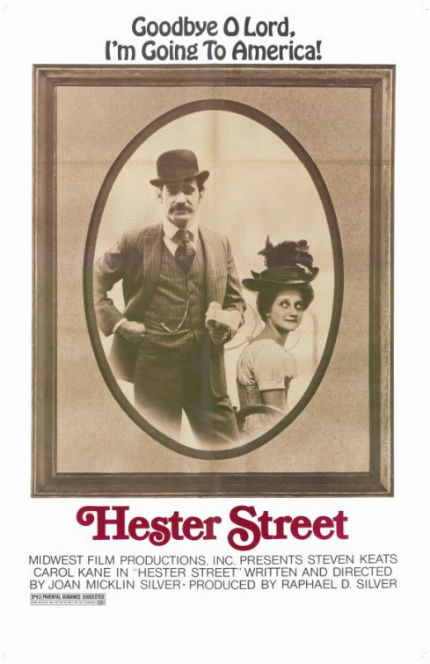 Selected in 2011 to be preserved in the National Film Registry of the Library of Congress, Hester Street is today available on Blu-ray from Kino Lorber. The disc has no additional features, but this is a case where the quality of the film by itself justifies the cost of purchase. Hester Street is a rare, quality drama that is affecting, touching and wryly funny without being overly sentimental or harsh toward its characters. I respect how the story is told and love how the film ends. 70s Rewind is a weekly feature that empowers the writer to ruminate on his favorite movie decade.